Print Book 250 pages in 1 volume (printed book) with downloadable forms Note: For print books, with MCLE's supplementation service, new supplements and revisions are mailed automatically with an invoice. If you do not want to subscribe, please check the opt out option during checkout. Expertise in one's area of practice is only one aspect of success as a solo or small firm lawyer. The second component is the day-to-day operations of a practice, the handling of data and finances, cultivation of clients, management of staff, and the marketing of professional services through various channels. The third essential requirement is to stay current on the law and dealing with the inevitable stress that comes with performing a professional high-wire act. 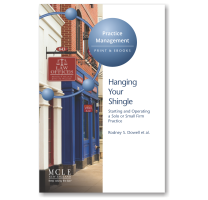 Hanging Your Shingle: Starting and Operating a Solo or Small Firm Practice is a comprehensive, engaging, and practical guide to the many challenges of law practice management. With concrete examples, perspectives from experienced solo and small firm practitioners, and expert ethics commentary, this publication is an indispensable resource for any lawyer contemplating, starting, or seeking to improve a solo or small firm practice. John M. Lawlor, Esq., Massachusetts Continuing Legal Education, Inc.